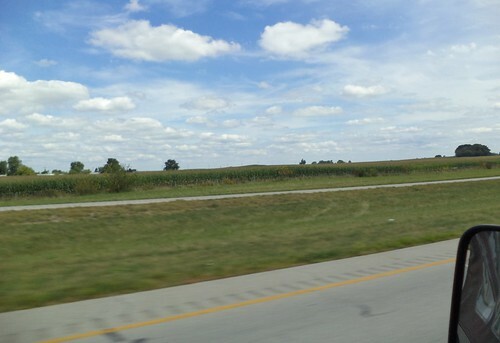 Ohio isn't much different than Iowa. 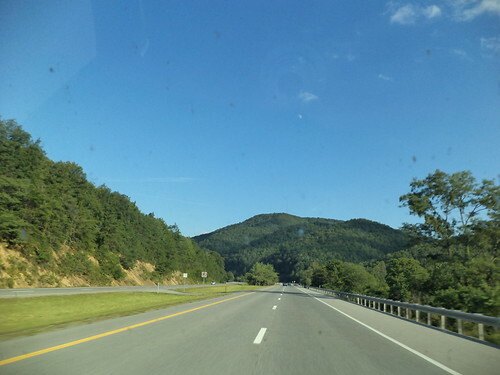 I could be on the road to visit my mom instead of somewhere on US 35, southeast of Dayton, heading towards West Virginia. Corn. Miles and miles of corn. Blue sky. Puffy clouds. 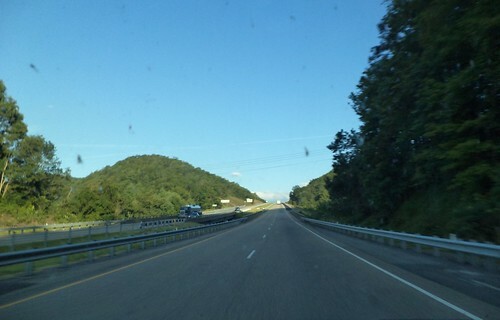 And then I reached the Ohio River and crossed into eastern West Virginia. The photos below, of Charleston, hint at the driving to come. From there, it was up into the mountains. We don't have mountains out here in the midwest. We have hills and valleys. Sometimes, as when you're walking the Fire Trail at Effigy Mounds National Park, those hills can seem like mountains, but they aren't really mountains. 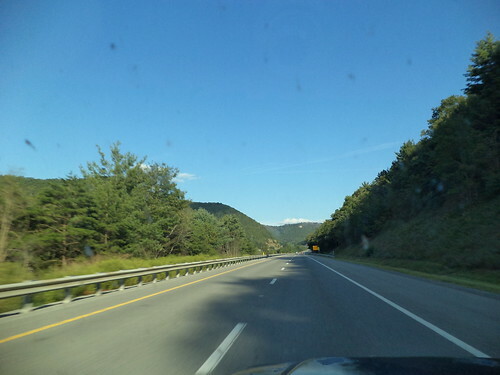 I was directed to get off the West Virginia Turnpike and follow Interstate 64 east. These don't look that intimidating. 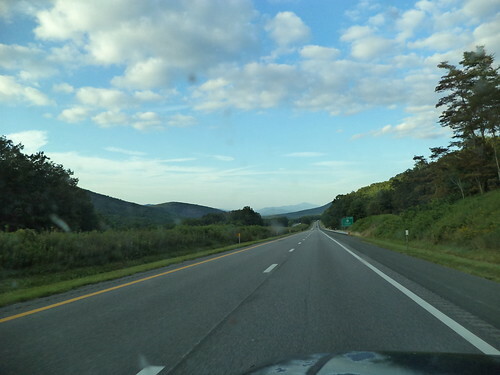 As I drove into and out of the shadows of the hills, the air temperature dropped noticeably. I had the driver's side window half-way open at this point, and it was interesting to go from a fully sunlit section to shade and feel the air coming in the window drop in temperature. Our ancestors took paths of least resistance. Going through the mountains with a wagon and horses must have been arduous. We have the technology to cut through those mountains. That lane on the right is where I discovered I would spend a great deal of time on an upward climb. 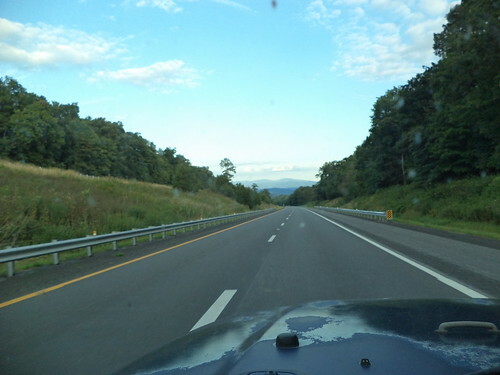 The Jeep is a good traveler, but for horsepower going up, it would slow down. I think the slowest I ever climbed was at 50 mph. It does give you time to look at what's around you. And then you cross the top of this particular mountain and it's smooth sailing down into the valley. 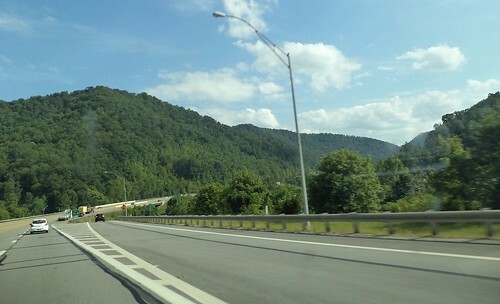 Setting down a road through the Appalachian Mountains is quite the feat of engineering. The past of least resistance, the trail used by our forefathers to get through this space, was followed in some locations. But getting from point A to point B sometimes meant bridging the gap between the hills. 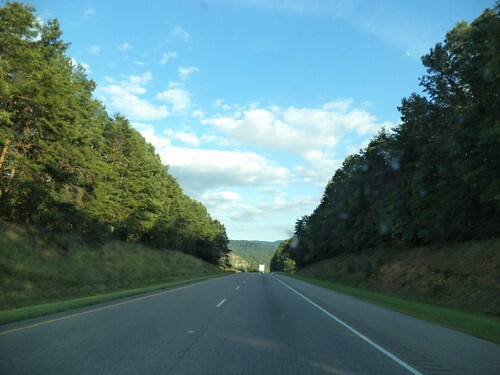 To the traveling public's ease, there are often long sections of straight road. It hugs the right side of one hill and the left side of another with a bridge over the gap between them. The road is separated here by a median of trees. There is a peace to travel here. Few cars, few trucks. Just me and the music, Benny Goodman at this point, and the sky and the sun and the clouds and the shade. You don't see this scenery around Wheaton, Illinois. I came over a rise and saw the patterns on the mountains. I wondered how they got the different colors of trees. Then it hit me. Those color changes are the shadows of the clouds. 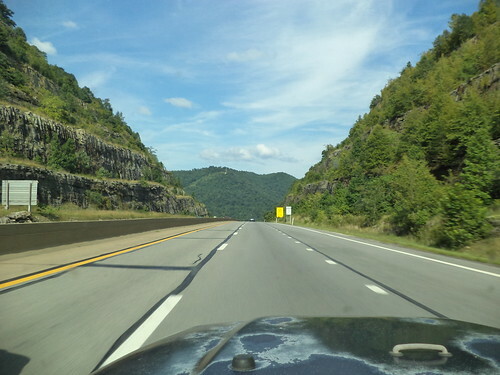 I leave you with two more photos taken in eastern West Virginia. This area is in Great Smoky Mountains National Forest. It's clearly evident why they are called "The Smokies". 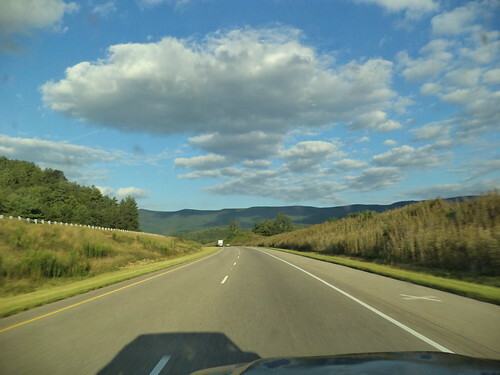 Some day I want to go back and drive the Smoky Mountain Parkway just because it's there.